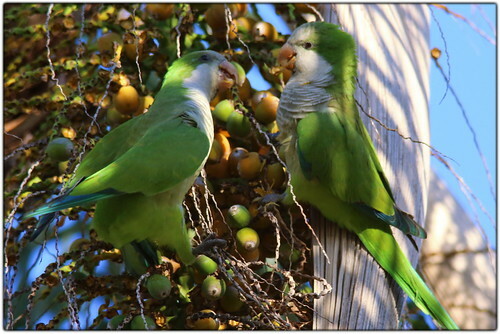 My favorite wildlife subjects are the wild and in-home Quaker Parrots of South Florida. 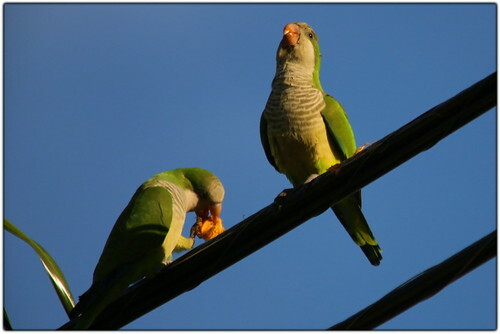 As far as I can tell I’ve taken in excess of 15,000 photos of Quaker Parrots over 2 decades. 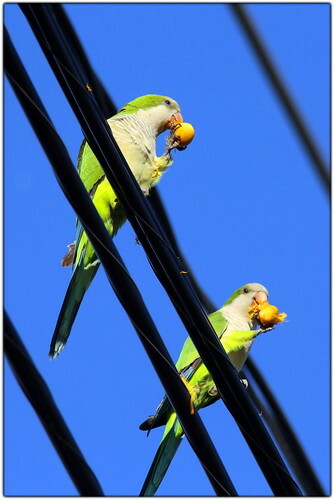 This is a series of photos I recently captured one afternoon as I was passing a small office complex where I heard a flock of wild Quaker Parrots enjoying their afternoon snack. I love to watch Quaker Parrots, they have wonderful personalities and make the best faces as they work out the pecking order of the flock. 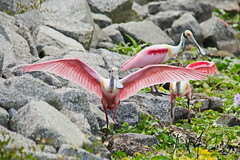 The birds in this flock are still fairly young, you can still see a bulge in their upper beaks. 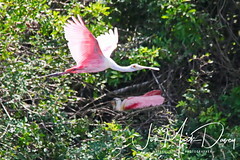 As they grow the bulge will gradually disappear leaving a sleek beak line. Quakers are known for searching the tree to find just the right fruit for the morning. The Palm Tree seeds turn a bright orange when ready to eat. Quaker Parrots are real characters. I truly believe that they are as curious about us as we are about them. I know from having indoor parrots for the better part of 20 years that they are inquisitive birds. 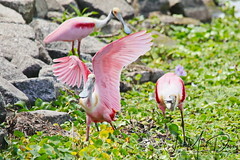 They are curious and they enjoy the company of people. 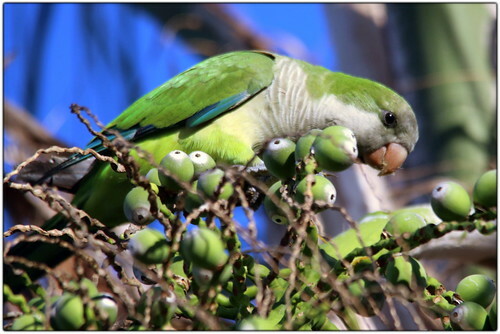 In North America most Quaker Parrot flocks are close to higher populations of people, they are escapees from homes, zoos, open crates at the airport and other routes. 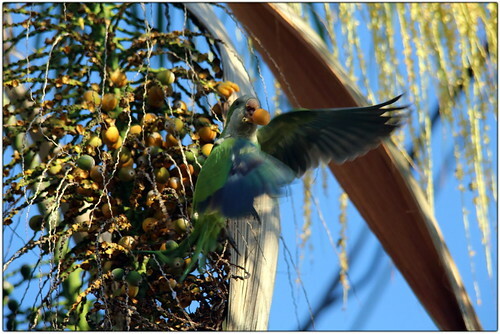 Quakers will really dive into a Palm Tree with berries just to find the perfect batch of berries. Once the Quaker Parrot finds the perfect juicy palm fruit he will spend a moment checking out the surroundings readying for the takeoff. 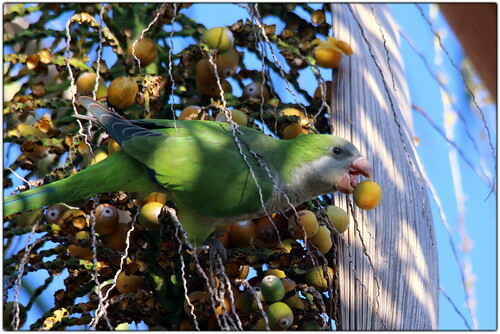 This Quaker, also known as the Monk Parrot, can capture a Palm seed and escape the tree almost without notice. 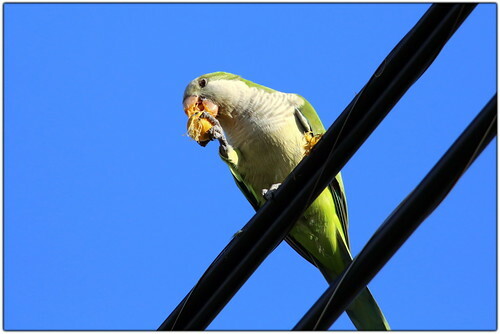 Once the parrot is free of the Palm Tree he will fly to an overhead power wire and relax to enjoy the eating of this wonderful fruit. 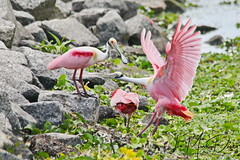 Eating is truly a social event, one where few or many birds get together to feed. 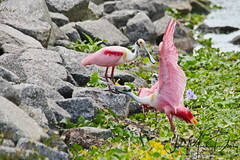 They will end up on the same tree, or wire, just to be social with each other. 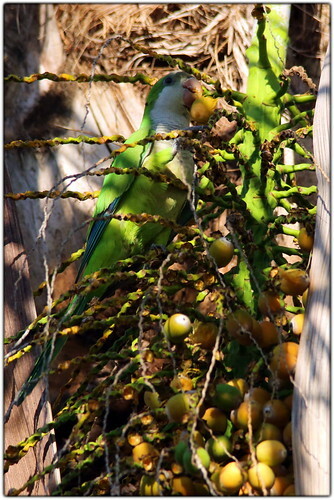 Very seldom do I find a single Quaker Parrot eating alone. Parrot banquets are truly the daily social event. 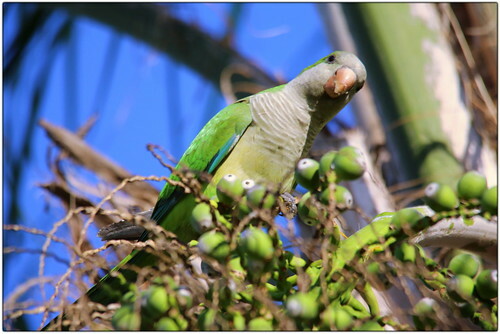 Most of the time, if you see or hear only one parrot, it’s for a single fly through or very temporary. 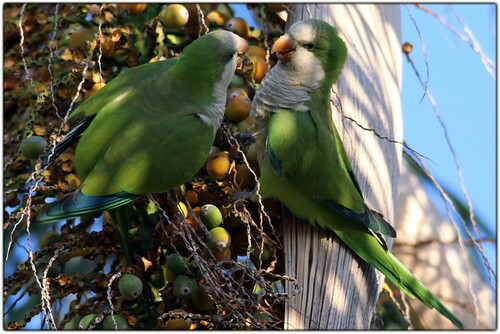 I love the Quaker Parrot, Monk Parakeet, they are characters, they are fun to watch and thoroughly brighten my day when I see them. 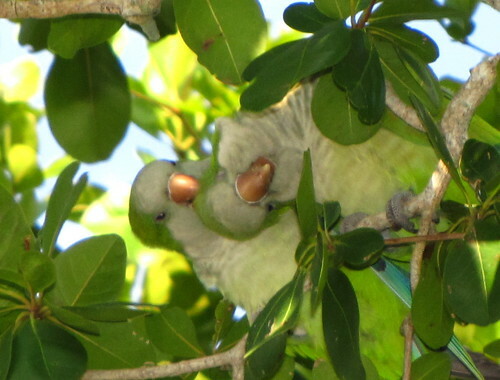 How could anyone hurt these cute little green parrots? Thank you so much for sharing these beautiful photos with us.